Earth is surrounded by an atmosphere of gases about 800 km deep. The gases are densest at the earth’s surface. The atmosphere consists of five different layers, each with distinct characteristics. Extending up to 18 km above the earth’s surface, the troposphere is the most active part of the atmosphere. Weather only occurs within this layer because it holds virtually all of the atmosphere’s moisture, either as invisible water vapour or as clouds. 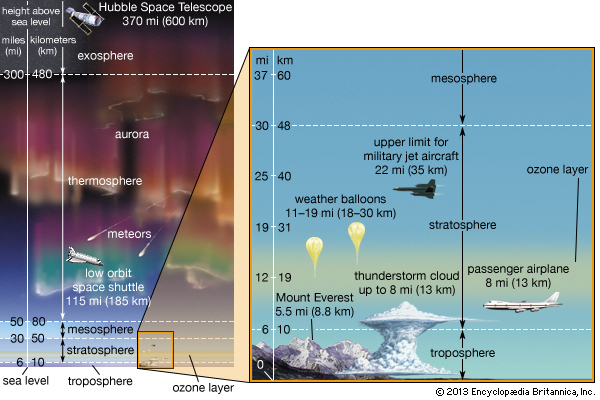 The stratosphere lies above the troposphere at 18 to 50 km above the earth’s surface. Ozone, which filters harmful radiation from the sun, is abundant in this layer. Unlike the troposphere, where temperature decreases with height, the stratosphere’s temperature increases with height due to ozone-related chemical reactions. The air in the stratosphere is still and clear — passenger aircraft fly within its lower levels to avoid turbulence in the troposphere. The ozone layer lies within the stratosphere at an altitude of 20 to 30 km. It acts as the earth’s shield by filtering harmful ultraviolet radiation from the sun, and protecting life on earth from its detrimental effects. The ozone layer exists because oxygen filtering up from the top pf the troposphere reacts under the influence of sunlight to form ozone. The “photo-dissociation” of oxygen is greatest above the tropics where solar radiation is most intense and direct. From here, ozone is transported by winds within the stratosphere around the earth, towards the polar regions to maintain the ozone layer. The atmosphere is a massive heat engine, transferring heat from the tropics towards the poles. In the tropics, strong solar heating of the earth’s surface generates powerful convection which continually lifts warm, moist air up into the atmosphere. This rising air sets up large scale convection cells, known as the Hadley Cell, north and south of the equatorial zone. As the rising air reaches the tropopause, it starts moving poleward, finally cooling and sinking near the subtropics. The sinking air flows back to the equator as trade winds, completing the circulation. 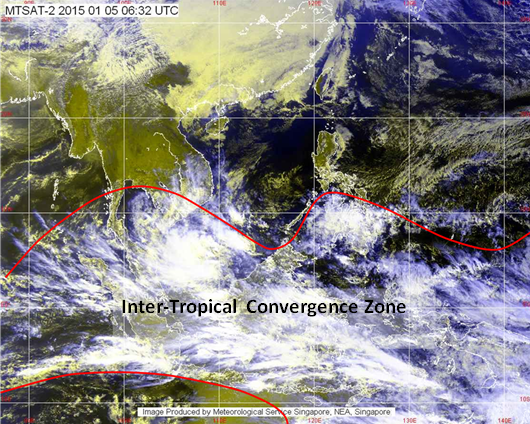 The trade winds from the northern and southern hemispheres converge close to the equator in the Inter-Tropical Convergence Zone (ITCZ), which is marked by a narrow zone of rain cloud clusters.